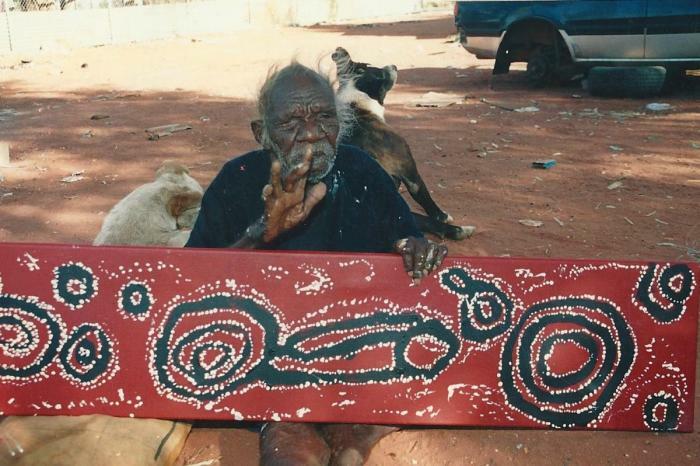 Peg Leg Tjampitjinpa was born around 1920 in the area around Wilkinkarra, where he lived with his family until 1957. In 1964 he moved with his family to Yuendumu. Since 1984 he is a trustee and important member of the Wilkinkarra Land Trust. Today Peg Leg Tjampitjinpa lives in Watiyawalu, close to Mount Liebig. Peg Leg was a good friend of Pinta Pinta Tjapanangka, a family member and a renowned painter. Encouraged by Pinta Pinta, Peg Leg began painting during their stay together in Walungurra. However, he stopped painting after Pinta Pinta died and his eyesight began to fail. After an eye operation restored his sight almost completely, Peg Leg started painting again with renewed enthusiasm and inspiration. 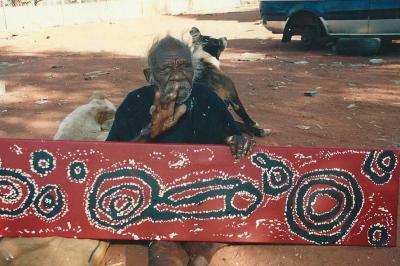 Like many other Pintupi painters, Peg Leg draws the inspiration for his work mainly from the stories of the Tingari. This is a vast collection of religious stories, ceremonies and laws that was transmitted to the inhabitants of the Western Desert by the Tingari. The Tingari were a group of mythical, spiritual beings that according to legend, crossed a huge area of the Western Desert while performing rituals and thereby shaped the landscape and various holy places. Peg Leg uses the features of traditional patterns with interconnected circles and dot work. Overall, he opts for pure ochre hues on a black or red background. Although his work is strongly reminiscent of the style of the Pintupi painters from the early 1970s, with a limited palette and a focus on Tingari design, his work has an undeniable personal signature and is easily recognizable.